STOP THE PRESS: Save a remarkable 40% off the shelf price of music magazines here. The first thing to note about guitar magazines is that they are a great resource for learning to play many different styles of guitar. One major advantage of learning to play guitar from lessons in a guitar magazine is the cost. For around 6 pounds a month (the shelf price… you’ll save considerably more if you take out a subscription) you get access to loads of great lessons (backed up by video lessons and/or backing tracks on a CD or DVD that is included with every issue). There are many guitar magazines out there. A quick scan of your local newsagent shelf and you’ll be scratching your head wondering which guitar magazine would suit you best. So we want to break it down for you. Most guitar magazines have a slightly different focus from one another and you should choose carefully depending on what style of guitar you want to learn to play. You should ask yourself what you want to from a guitar magazine. Chances are you want to be able to learn some songs to play on guitar. What kind of songs do you want to play? Rock guitar? Blues guitar? Heavy metal/shred guitar? Classical guitar? Maybe you want to find out about guitar gear and are looking for news and reviews about the best type of acoustic guitar on the market to suit your budget… perhaps you want to know what your favourite bands are up to and what kind of guitar equipment they use to achieve their unique sound. For the aspiring rock and metal guitarist, Total Guitar Magazine also provides a wide range of instuctional guitar lessons as well as excellent interviews with top guitarists, bands and guitar gear as well as album reviews. Note that this excellent magazine is part of the same family as Guitar Techniques Magazine but is more focused on rock and metal electric guitar – having said that the lessons are excellent and will benefit all aspiring guitarists. TG also has an plenty for the novice guitarist to learn. Another magazine, also part of the Future Publishing family, is Guitarist. This excellent guitar mag has been published for about 25 years! This has a more broad guitar focus than Total Guitar Magazine placing more emphasis on interviews and lessons aimed at the electric guitarist, the acoustic guitarist and the bass guitarist. 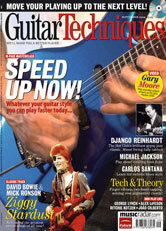 Note that subscriptions to these magazines will allow you to make huge savings off the shelf price and these magazines are an excellent guitar resource – as a developing guitarist, you can refer back to your older copies as your skill levels improve, to attempt the lessons or learn the guitar transcripts that were previously too challenging. If you build up a collection of these magazines as a newbie guitarist, you’ll have a huge stockpile of lessons to refer back to. For that reason alone it is worthwhile considering buying a subscription rather than buying individual copies. Oh, and subscriptions to these guitar magazines make great gifts if you’re buying for someone else. To see more magazine subscriptions, visit the website of My Favourite Magazines here.